While there’s nothing like the smell of new leather, there’s something extra special about antique leather and restoring old leather to as good as new. Perhaps you just inherited a leather family heirloom. Maybe your parents sent your childhood ball glove to you. Or maybe you’re a lover of all things antique. Regardless, you need to restore it, and we’re going to tell you how. When working to restore antique leather, there are certain things that can cause irreparable damage. Let’s talk about those things first. It’s important to be careful with untreated antique leather. Old leather tends to be dry and stiff because it has lost most or possibly all of its natural oils and any previous conditioners. With the right care, you can restore antique leather so that it is soft and supple again, but you must proceed carefully. When antique leather items are found in dirty condition, it compounds whatever flaking, cracking and other problems they may have underneath the dirt. If this is the situation, a lot of personal judgement must be used before the decision is made to clean the piece. Cleaning will need some buffing, light scraping, and perhaps other handling that flaking leather just couldn’t take without unacceptable damage. We can’t really give any better warnings than that for the general condition of antique leather, but once the decision is made, we offer a treatment that is as gentle to surface finish as we have yet found. Even if it’s dirty, you do not want to wash or put any water on antique leather if possible. Since it is very dry and stiff, could water will harm the old leather, possibly stiffening it to the point of cracking. Instead, use a soft bristled brush, such as a shaving brush or natural bristle paint brush, to gently brush away surface dirt. In fact, you never want to pour anything on an antiquity. Doing so can dramatically darken the leather. Liquids will absorb so quickly that it will oversaturate the leather, which isn’t what you want, either. Keeping the above points in mind, apply Pecard’s Antique Leather Dressing as described below. Our dressing is specially formulated to condition hard, stiff, old leather without over-darkening or over-saturation. There will probably be some color change because leather lightens when it loses its natural oils, and returning those oils will restore the leather back to its natural, slightly darker shade. Apply light coats of Pecard’s Antique Leather Dressing with a clean, soft cloth, allowing 12 to 24 hours for each coat to be absorbed into the leather. Continue applying additional coats every 12 to 24 hours until a thin layer of dressing remains on the surface. If the piece that you’re treating has buckles, straps, pocket flaps, or other parts that could be broken when moved, only treat what you can reach without moving the leather around too much until lubricity has been returned to the leather (after a few coats). This will allow the old leather to become soft and flexible again. Once your antique leather can move and flex without worry of cracking, then you can move buckles, straps, and pocket flaps to treat underneath them. It’s not necessary to treat the rough or “flesh” side of the leather, but if you don’t mind it matting down the nap a bit, it’s completely fine to treat on both sides. Remove any excess dressing with a dry, soft cloth and gently buff the surface to a soft sheen. This buffing action melts the blend of waxes on the topmost fibers and helps repel water and dust. Keep in mind any areas where the leather was damaged, will no longer achieve a sheen. Congratulations! You now know how to restore, condition, and protect old leather from the elements. Apply follow-up treatments to antique leather two to four times per year or as needed to maintain proper protection and lubricity of the leather. 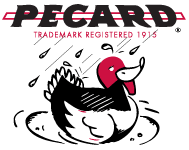 If you have any questions about restoring old leather, please feel free to call (1-800-467-5056) or email (info@pecard.com). We’re happy to help.